DISCOUNTED PATRIOTIC DECOR - CLEARANCE ITEMS! We have discounted patriotic decor, like patriotic angel, patriotic eagles, patriotic pins. Check more of our discounted patriotic decor! 14958 FALLEN HEROES PONY FRAME! Create a photographic tribute to a long-lost hero with this patriotic full color frame! 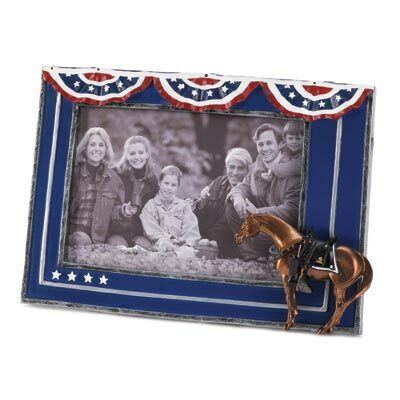 This distinctive addition to the Painted Ponies collection lets you display your portrait with true American pride. Holds a 4" x 6" photo. Easel on back. The Trail of Painted pony Collection. Weight: 1 lb. UPC# 748787124440. 8¼" x 1" x 5½" high. Browse our PATRIOTIC with images! Browse our PATRIOTIC without images! Check our Discounted PATRIOTIC - click here!